There's a lot to be said against the former GDR (East Germany). But when they said that the West had abandoned the scientific method, it was exactly people like Mercola that they ment. The concern about this particular vaccine are the adjuvents; additives bundled with the vaccine that elicit an immune reaction in the body against the deactivated flu virus. The adjuvents being used for the swine flu vaccine (mercury, aluminium and squalene) all have had links to various LONG TERM illnesses mostly nerological and autoimmune. Most flu vaccines for kids don't have thermisol/mercury... this one does. Squalene is the one that isn't even FDA approved and they are finding antibodies against in the soldiers who are experiencing the mysterious Gulf War syndrome. We are giving ourselves mere months to test the effectiveness and safety of a vaccine when the symptoms of these adjuvents don't appear for years. Think I'm going to make my pregnant wife, my 2-year old son and 5-year old daughter guinea pigs for this vaccine? No thanks. We'll take our chances with common sense and regular hand-washings. I hope that's not a foreshadowing of how most people think about the vaccine! He happens to be a politician but he still got a Phd at the university of hamburg. Afterwards he practiced medicine and lectured at multiple universities (such as John Hopkins) before becoming a politician. It's not about something developed by Baxter but about Optaflu that gets developed by Novartis. He argues at his website http://www.wodarg.de/politikfelder/gesundheit/2587792.html that Optaflu shouldn't be used at this season but that we should wait whether the patients in the test study might develop cancer before we should use it at a large scale. Till then he doesn't want that Optaflu but instead favors more convential vaccines. Then you have a Bild reporter who writes a bad story and doesn't fully represent Wodarg position. "More importantly, some people fear that the risk of cancer could be increased by injecting the cells"
"...people's fear of the pandemic [is] an 'orchestration': 'It is great business for the pharmaceutical industry', he [Wodarg] told the Neuen Presse." So it's not just a reporter writing a bad story - Wodarg is unambiguously making these statements on his own website as well as to the press. Steven, I certainly understand your position and indeed it may be the right position, although in your comment you do something that I assume you would be tempted to criticize in others, namely making a scientific assertion and then giving NO citation after it. Uh, how about just give one cite that supports your position that "no humans have ever gotten cancer from these vaccines". It's important to remember that the pharmaceutical industry may not always be on the side of the good guys. This article reports that "no serious adverse event due to Verorab has been reported" during 20 years of use and over 40 million doses. There are many more studies of the rabies vaccine, and there are other vaccines made from the Vero cell line, and I can't find any reports of cancer or anything like it. Thank you for your response. Let me start by saying that I particularly liked your post on the statin study (I read it some time ago; it's dated 11-15-08). I also personally think your credentials are excellent. Maybe Dr. Mercola is ignorant (I really don't know); however, you sure didn't prove it by putting the title Dr. in quotes. (You're not an osteopath or an MD (neither am I)) Would you like someone to put to refer to you as "Dr." Sazberg as though your PhD were simply junk since it isn't an MD...See what I mean? No references are given in the original story, and it appears to be completely invented. These cells have been used in the past to produce other vaccines, including rabies and measles (references are easy to find), and no humans have ever gotten cancer from these vaccines. Again, I assume you may have actually meant something like: you knew of no reported claims of cancer from the vaccines. When you make such a general statement (like in the original post) and then have no citation...well, isn't that the kind of thing you would criticize in people you disagree with? You see my point? 1. If Vaccine is harmless why would pharma companies need LEGAL IMMUNITY? 2. Should we ex-ante bless companies like Baxter with legal immunity? We don't know ... so it must be true ... even if nobody has ever seen any evidence for it. I should sue you for slander. I never lied to the FDA, my company ALWAYS told the truth. What we did was violate FDA rules which prohibit companies from making claims about a product even though they are true and published in peer reviewed journals like Science and Nature. I suggest you get your fact straight before you write your next bit of slander or you may find yourself as a defendant in court. Obviously "Health Gizmo" isn't Dr. Mercola, although he seems to be trying to suggest that by writing "What we did..." and "my company". I'm leaving the comment up (as well as the previous comment by Radovan) just to show readers of this blog a view (perhaps an extreme one) from another side. "A ninth conundrum evident only recently is that epidemiological studies question vaccine effectiveness, contrary to randomized controlled trials, which show vaccines to be effective. For example, influenza mortality and hospitalization rates for older Americans significantly increased in the 80's and 90's, during the same time that influenza vaccination rates for elderly Americans dramatically increased [7,8]. Even when aging of the population is accounted for, death rates of the most immunized age group did not decline . Rizzo et al studying Italian elderly, concluded, "We found no evidence of reduction in influenza-related mortality in the last 15 years, despite the concomitant increase of influenza vaccination coverage from ~10% to ~60%" . Given that influenza vaccinations increase adaptive immunity, why don't epidemiological studies show increasing vaccination rates are translating into decreasing illness?" sited on Dr. Mercola's site. Of course i use discernment when listening to people like Dr. Mercola. His advice is far from the golden calf to be worshiped but i think his advice is WAY closer to the way we should ACTUALLY be living instead of getting jabs, and pills for everything. But i also use discernment listening to people like you, because the way i see it fear mongering goes both ways. 2. Thomson et al., JAMA 2004 Sept 15;292(11):1333-40. 3. Rizzo et al, Vaccine 2006 Oct 30:24(42-43);6468-75. All three studies reported consistent findings, essentially that influenza mortality among the elderly remained constant from around 1980 through 2001, even among populations where vaccination rates were increasing. The claim that rates "significantly increased" which you quote above appears to go away (according to these studies) when you adjust for the length of the influenza season, which varies from year to year. However, none of these studies concludes that the vaccine is ineffective. Instead, they hypothesize that the steady rate of mortality among the elderly (particularly those 85 and older) may be due to immune "senescence" (which means that the immune system is much weaker in the elderly) and/or that the vaccination efforts didn't adequately target these groups. None of these studies question the effectiveness of the vaccine among the bulk of the population, from childhood through the age of 65. In fact, the increased susceptibility of the old is another important reason for widespread vaccination: with sufficient coverage rates (which need to be near 90%), we gain "herd immunity" which means that the virus cannot easily spread, which in turn means that the elderly are less likely to catch the flu from others. Mercola is picking and choosing studies out of context to spread his anti-vaccination message, and he is using his scare tactics to sell people his "natural cures" and vitamin supplements. There is no scientific evidence whatsoever that his "cures" work, but he seems to be motivated by money. I wouldn't trust anything I read on his site, which is filled with misinformation. I am not debating the effectiveness of vaccines. I do think there is a place for for of them. the tetanus shot is one example. What i am saying is that i believe there could be better more effective ways of fighting disease. However it is hard to look at other options when you are wearing vaccine colored glasses. Maybe you didnt read the study i cited? A low dose (of VItamin D)(800 IU/day) not only reduced reported incidence, it abolished the seasonality of reported colds and flu. A higher dose (2000 IU/day), given during the last year of their trial, virtually eradicated all reports of colds or flu. So maybe you could read the study and tell me why I should subject myself to a flu shot, if all i have to do is regulate my Vit D levels? Why are more studies like this not being done? It seems much more logical, not to mention economical, to further investigate these options and maybe we wouldnt even need flu vaccines to begin with. It is theorized that the viral load is what actually kills a person that has the flu. If the viral load is too great the body cannot send enough soldiers to the front lines to kill the enemy and your army is eventually defeated. All you have to do is decrease the viral load and...viola'! you get better. But when the main stream media and the CDC give recommendations about flu treatment it is always the same song and dance..."just head on down to the store and get you some of that there tamiflu". Studies have shown sambucol to be 3 times more effective in reducing the viral load than tamiflu. Have you ever heard of the CDC recommend sambucol? Hell no, they won't even study it since it is considered a "natural" remedy. Plus there is no money to be made so why bother. I propose more studies be conducted on the stuff that seems to actually works (like sambucol, Vitamin D) and less on the stuff that just kinda-sorta works (like tamiflu, vaccines) but makes loads of money. I would love to hear your thoughts on these things? So on this topic I think we agree. 2. That reference you give is to a letter written in response to an article, not an article per se. However, I can't read either one without paying the publisher $35, which I'm not willing to do. There are much better studies that are available for free, either open access or because my University has a subscription to the journal. 3. Vitamins are often claimed as cure-alls by quicks. Be skeptical of such claims - they are almost never true, although there is a tiny germ of truth in some of them, which quacks exploit to the utmost. E.g., vitamin D deficiency is certainly bad for you and causes rickets, and it can weaken your immune response. There is no evidence that I've seen - and I've read immunologists who back this up - that vitamin D *supplements* will "strengthen" your immune system. Big difference. 4. There is no doubt that influenza has a marked seasonal variation. It is always much worse in the winter. There is a considerable literature trying to explain this, with a variety of possible explanations - cold temperatures, people crowding together indoors, and lack of sunlight (hence the vitamin D hypothesis). in which the authors discuss some of the latest evidence, which points to high humidity (during warm seasons) as being an important cause for the flu's failure to infect as many people during summer months. But the jury is still out. Studies are continuing to be done on various causes of influenza seasonality, but we don't yet have any good studies that demonstrate that vitamin D supplements prevent the flu. "What if everything we think we know about fighting influenza is wrong? What if flu vaccines do not protect people from dying - particularly the elderly, who account for 90 percent of deaths from seasonal flu? What if expensive antiviral drugs that the government has stockpiled over the past few years also have little, if any, power to reduce the number of people who die or are hospitalized?" Lisa Jackson, a Seattle physician, questioned the est of 50% mortality reduction for people who get seasonal flu vaccine. Her studies found the flu vaccine itself might not reduce mortality at all. "Most experts agree it's only a matter of time before we're hit by a truly devastating flu pandemic - one that might kill more people worldwide than have died of the plague and aids combined. In the US, the main lines of defense are pharmaceutical. Yet now some flu experts are challenging the medical orthodoxy and arguing that for those most in need of protection, flu shots and antiviral drugs may provide little to none. So where does that leave us if a bad pandemic strikes?" An estimated 50 percent of healthcare workers say they do not intend to get the swine flu shot and don't routinely get seasonal flu shots, in part because many doubt the vaccines' efficacy. Vitamin D is so much more important than just the prevention of rickets. Linda White, MD: "About all I was taught in medical school is that vitamin D keeps bones strong. This area of study has exploded as scientists uncover the vitamin’s far-reaching effects. It also regulates cells all over the body, which explains vitamin D’s disparate roles, such as influencing insulin production and immune function, as well as helping prevent inflammation and cancer..."
In 2007, researchers at the Moores Cancer Center, UCSD, published findings that women with higher levels of Vitamin D had lower levels of breast cancer. They estimated possibly half the cases of breast cancer and 2/3 the cases of colorectal cancer in the US could be prevented with higher levels of D.
Renowned UCLA researcher Bruce Ames, Ph.D., notes the wide distribution of vitamin D receptors throughout the brain, and D appears to affect brain proteins responsible for learning, memory, motor control, and behavior. Meanwhile, March 08, the CDC reported 97% of Americans are contaminated with the sunscreen ingredient oxybenzone that has been linked to allergies, hormone disruption, and cell damage. And you poo-poo vitamin D as just for rickets? And vitamins in general are quackery? As reported last year, UC-Berkeley scientists demonstrated vitamins repair DNA damage. "There are many genetic differences that make people's enzymes less efficient than normal, and that simple supplementation with vitamins can often restore some of these deficient enzymes to full working order." Rachel Carson (author, Silent Spring) rang the warning bell in the 1960s that our "living better through chemistry" was costing us dearly. What hubris to think that man-made chemicals injected into our bodies will save us. The historical record is clear: vaccines did not diminish diseases as much as did sanitation. The lesson repeats in events like Katrina when infrastructure goes away and unhealthy conditions erupt. We don't need a vaccine for swine flu. We need a public educated as to what builds a strong immune system. As Pasteur said on his death bed: the pathogen is nothing; the terrain is everything. "What if everything we think we know about fighting influenza is wrong?" - is classic over-hyped, irresponsible reporting. The reporters pose a hypothetical question, clearly suggesting that yes, it's all wrong! But in fact this is nonsense. It might be that some of our knowledge about influenza is wrong, and it's certainly true that we don't know everything about the flu, but that wouldn't sound nearly so dramatic. I'm very disappointed in The Atlantic for joining the scare-mongering and going for the all-too-popular strategy of reporting the controversy, rather than reporting the facts. The vaccine inserts clearly state that the VACCINES HAVE NOT BEEN TESTED FOR CAUSING CANCER. Uh Steve... You begin your dispute of vaccination precipitating autism with the statement.. "Overwhelming evidence to the contrary??????????? Scuse me, but with hyperbole like that, could you offer up at least ONE article citation or credit? That phrase is linked to a lengthy post created as a resource on this topic over at Science-Based Medicine. If you read that post, you will see that it contains dozens of references - too many to count quickly - all supporting the conclusion that vaccines have NO LINK to autism. All you have to do is click the link in my post. Thank you for an intelligent article. I searched Dr. Mercola in response to a warning against H1N1 vaccine which arrived via email. I avoid flu vaccines preferring herbal and homeopathic remedies, which have done me well in the past. None the less, the forward's claims rang less true as i read on. Then i saw they originated from dr. Mercola's site which i discovered some time back and realized it was really a self promoting product website. Not that there is anything wrong with entrepreneurialism, but it appeared to be major conflict of interest to promote products one profits from. Thank you for providing grains of salt for doubt, in the form of actual studies. People can choose to believe Mercola, or doubt him, but should at least make an educated decision, which you are offering. Before you make disparaging statements about Doctors of Osteopathy, please educate yourself about the training/education they recieve. M.D.s are not superior, D.O.s attend a different school of study and philosophy. One misinformed and ignorant statement invalidates your article. Rumsfield was quite in a financial position to benefit from a swine flu pandemic. This alone should make you think conspiracy theory. Bush investments in haliburton. Why do these politicians make it so easy for people to think of conspiracy theories? Or could it be there all crooked like every other politician before them. Laurie: I didn't make a disparaging statement about osteopaths, but since you brought up the topic, I would point out that many people - myself included - consider M.D.s to be superior to D.O.s. All of the top medical schools offer M.D. degrees - the best students go to these schools, not to the 20-odd schools specializing in D.O. degrees. Osteopathy also has a dubious history, which it has spent many years trying to shed, but as a profession it still includes a relatively higher number of practitioners who use unscientific treatments, especially "osteopathic manipulative treatment" (OMT). OMT has its basis in a completely unscientific belief, invented by the founder of osteopathy (Andrew Still) in the 19th century, that manipulations such as shaking and massage could cure diseases such as scarlet fever and diptheria, among others. So I'll go with an M.D. over a D.O. any day. Well, you may feel that Wodarg "may not know beans about flu" but he does appear to have a pre-political background you may respect. Among other things he was a Fellow of Epidemiology and Health Economics at Johns Hopkins in 1991. Are you a peer of Dr. Paul Offit? He is working for and with pharmaceutical companies and promotes his own financial interests over the public health, which violates his Hippocratic Oath. I am trying to figure out what your agenda is based on? It seems to have nothing to do with protecting or preserving humanity. I would be honored to be a peer of Dr. Offit, but he and I are in slightly different fields. He is an M.D. with decades of experience in vaccine development and children's health; I am a Ph.D. with experience in genomics and evolution, including influenza evolution. Your statement that Dr. Offit promotes his own financial interests over the public health is flat-out wrong. He has spent his career trying to improve children's health, and his rotavirus vaccine has saved the lives of tens of thousands of children. He is donating all the profits from his latest book, Autism's False Prophets, to autism research. I've read the book and I highly recommend it to you; I also suggest you look at his website, http://www.paul-offit.com/, and not at the many distorted attacks that have been launched at him in the media. Dr. Mercola, in contrast, does exactly what you accuse Dr. Offit of doing: Mercola promotes his own financial interests over the public health. One look at his website should be enough to make it clear that he just wants to sell, sell, sell. Don't let him fool you. "The article on mercola.com (the website of Dr. Joseph Mercola, more about him below) calls him "Dr. Wodarg", but when I checked Wodarg's own websites, I found that he was a politician in the German parliament who claims to be an expert on health matters." "He studied medicine in Berlin and Hamburg and obtained his medical degree and a doctor´s grade from the University of Hamburg. He obtained his postgraduate qualifications in internal medicine and pneumology, in public health, social medicine, hygiene and environmental medicine in Germany and further training in epidemiology at Johns Hopkins University/ Baltimore, USA. Dr. Wodarg worked as a ship´s doctor, port health authority and in the Bernhard-Nocht-Hospital for Tropical Diseases in Hamburg. He practiced medicine in several clinics and was the director of a public health institute in Northern Germany for 13 years before getting elected for the German Bundestag." So according to the website, which you didn't even try to attack its' credibility, Wodarg is a doctor and a specialist in many areas of medicine that are linked directly to flu (pulmonary diseases, epidemiology). Since Wodarg is a long time politician in a western country that specializes in health, and chariman of the health commity of the european council, I find it very hard to believe that he would lie about his background, and even if he did, that he wouldn't be exposed. So I stopped reading your post at the sentence on Wodarg's background, because right there you lost your entire credibility from my POV. My comment is entirely accurate. He is a politician, as I wrote, and despite having medical training, he doesn't know anything about the flu - or worse, what he thinks he "knows" is wrong. Also, note that many politicians "specialize" in health without knowing much about it - we have some noted examples in the U.S. Congress, some of whom created our own embarrassing agency, NCCAM. I would also add that Wodarg's site is very careful not to state that he has an M.D. - it says he studied medicine, which in Europe is often done at the undergrad level. It says he has "training" from Johns Hopkins but doesn't mention a degree. That raises my suspicions even further. I stand by my comments. I didn't say he wasn't a doctor. I said he is a politician. So let's agree that he had medical training in the past. I don't know what he learned, or when he learned it, but he doesn't know about the flu virus, the evolution of influenza, the influenza vaccine, the methods of choosing a vaccine, or the epidemiology of the flu. In principal, this shouldn't be surprising - doctors have specialties, and relatively few of them specialize in infectious diseases. But Wodarg is throwing around his medical credentials to give himself credibility, and then he's making incorrect, irresponsible, and inflammatory statements about the flu. It's just nuts to claim that the flu vaccine might cause cancer. In fact, I don't know how anyone with even a modicum of medical training could believe this. He doesn't deserve any respect after making such wild claims. Here's an example of what I mean. Everyone talks about polio. The graph we always see is from the 50's onwards. This clearly looks like the vaccine is working. If you look at the actual chart from the 20s you see polio cases were already well over cut in half before the polio vaccine was introduced. 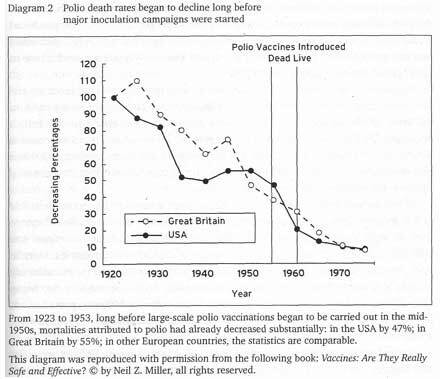 The real reason for the decline in polio is probably better health and hygene. Which is why polio is still a concern in third world countries. Science can easiltu be manipulated. Anon: that image is a good example of misinformation you can find on the web. Polio reached its peak in the 1940s and 1950s, before the vaccine dramatically reversed its progress. How can you believe a chart that shows mortality of more than 100%, as that one does? But you're also confusing mortality with the other effects of polio. Polio often causes devastating paralysis, but its mortality rate (the percentage of those who die after being infected) was never that high. "Polio has not been eradicated by vaccination, it is lurking behind a redefinition and new diagnostic names like viral or aseptic meningitis. According to one of the 1997 issues of the MMWR, there are some 30,000 to 50,000 cases of viral meningitis per year in the United States alone. Check it out. Just google her. Interesting. Scheibner is a retired geologist who has become an anti-vaccine activist. She apparently doesn't even understand that the polio virus is a distinct species of virus that can be definitively diagnosed. The vast majority of cases of viral meningitis are caused by other viruses. I see no reason to give any credibility to Scheibner, who appears to be a crackpot. What do you think about what he said about cancer being a fungus and being able to cure it with sodium bicarbonate?? @Steven - thank you for your continuing efforts here. As you can see, you've been trolled by the Mercola Machine. Your patience is admirable. Now that swine flu turned out to not be anything near a pandemic, are you going to take back your fearmongering about the disease? Or do you still stand by it? I'm just wondering as one of many thousands (millions?) of people who never got a swine flu vaccine and never got swine flu. 'The Vero cell line was established in 1962, starting from a primary culture of vervet monkey (Cercopithecus aethiops) kidney cells (7). After further passages, the cell line was transfered to the American Type Culture Collection (ATCC) and in 1979 a primary cell bank (PCB) was established, starting from one ampoule of cells at the 124th passage level (8,9). The PCB was used to prepare several manufacturers' working cell banks (MWCBs). The former was tested according to the existing requirements for continuous cell lines used for inactivated virus vaccine production (1), for the latter, the tests were completed taking into account the latest requirements available (10). My son got a chicken pox vaccination 3 days ago & woke up with chicken pox TODAY!! VACCINES ARE POISON!! Oh dear so sorry to hear this 'No Vaccines' hope ur son is doing ok now?! YES FAR TOO MANY TOXINS in VACCINES...neuro-toxins mind you...please do more research before you dose your baby up with 30-40 shots before they have even established their own strong immunity...THINK TWICE before you by into this rubbish that the BIG PHARMA /Gov /MD's is feeding everyone!! Doctor Mercola is AWESOME!!! Love how he informs us of the other side of the coin...another perspective is very refreshing...makes us think outside the box, the box we have been so strongly conditioned to stay inside of. We are not sheep, we can make informed, intelligent, empowering, decisions for our child & children's children. We know when we are not being told the whole truth..we can sense it & we can research it. 30-40 shots of vaccines, majority of ingredients are toxic ...neuro-toxins, that you shouldn't even put on your skin let alone inject into you body. Why don't we all take the time to Research ingredients .. then call or email manufactures for the ill-effects to humans ...as by law they have to provide. Most list them & WARNING say not to get on skin or in eyes or ingest as highly toxic. SO WHY ARE THEY BEING INJECTED INTO BABIES?? I research into it more & i was shocked! Its ridiculous & getting way out of hand ... It's pure Assault to babies newly forming Immune system!!! Do they have choice what they are getting subjected to? Its not just him there are MANY MD's, Neuro-surgeons, specialists etc are all coming forward & stepping out to inform us of the suppressed truths & case studies & ill-effects, damages to babies & adults, & toxic ingredients lurking in vaccines, & the Agendas of vaccines. They have taken the time to write & publish books on it even. Why would a Neuro-surgeon's & Phd's specialists put there name & credibility on the line??? ....BECAUSE THEY CARE!!!!! Please just do more research... one sided information is not good for anyone!